If style and luxury are important to you when driving around Willmar, the 2019 Chrysler 300 could be the perfect full-sized luxury sedan for you. Mills Chrysler Dodge Jeep Ram can show you the high level of customization that is available so that you'll love everything about this vehicle. The Chrysler 300 comes in 16 different interior styles. You can choose to get heated and ventilated front seats that are leather-trimmed and comfortable to sit in. The leather on the steering wheel can complement the color of the seats to add to the cohesive style of the vehicle. 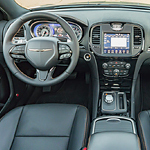 To keep you informed about everything the car is doing, the Chrysler 300 has a beautiful Digital Display Cluster. You'll have access to the temperature, trip distance, system status, and engine performance. From the steering wheel, you'll be able to access your audio selection and speed control.